Apparently he is running, and given his popularity in a deep Red State, likely to win an easy victory. And although I don't agree with his politics, he is also no friend of Trump, laughs. That might be his only redeeming factor at this point. Woo Hoo, maybe he'll vote on the Dems side, eh? 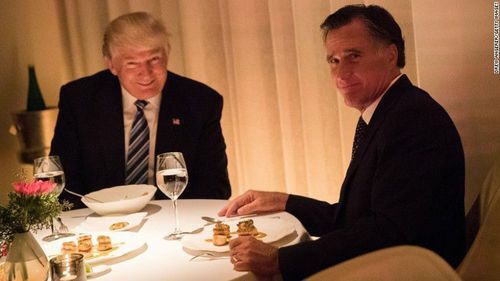 One of the more amazing things Trump and the current GOP has done is make me pine for the days of candidate Mitt Romney. And I really can't stand Mitt Romney's politics. Can we make him travel back and forth to Washington and Utah in a cage on top of a mini-van? Former governor of Massachusetts who happens to own a house in Utah says "Utah" about a billion times in his 2 minute announcement video. Listen to how he emphasizes UTAH at the 1:19 mark - "I believe I can help bring UTAH’s values and UTAH’s lessons to Washington." Yea, I fully anticipate he'll be one of these Republicans who "denounces" Trump and snipes at him on Twitter, then votes with him 95% of the time. With "opposition" like that, who needs friends? If one remembers that wonderful photo of Trump and Mitt dining together it kind of indicates that The Donald will still be playing "Dance Monkey Dance" with him when he is elected. Hmm, anyone know how to resize? He wants to bring Utah values to the Senate....yeah, no thanks. Wouldn't that mean all the men in the Senate would resign if any females were elected too? If so, I'm all for it! Add "medium" after the image number. Etc. I'd be a lot more interested if I thought Mitt would be truly independent instead of another GOP apparatchik. ObamaCare was, after all, originally RomneyCare. No need to elect any women, Mitt will be bringing his binders. Well, he is Mormon, so having legitimately close ties to Utah isn't exactly a stretch to believe. He was a decent governor and isn't a big liar. I think he is genuinely religious and the values of his religion are generally positive. He should run as a conservative independent. I don't think the republican party can be saved at this point. I think it's lost to those who pander to the wealthy, racists and corporations. He wasn't that bad when he was governor of MA. His shift when he ran for President changed that pretty dramatically. At this point, a Republican with measurable values and a willingness to stand up to the President seems a good thing to me. I don't agree with all of them, to be sure, but it beats the lick-spittle crap too many of them are willing to accept now. I'm guessing he's running as a Republican because he wants another chance at the presidency. I don't think his shift to the right during the 2012 Republican primaries was real. He was forced into right wing positions he did not believe in, in order to get the nomination. Well, if he hadn't stuck with them since, I might agree. But we'll see what he runs on. That's a one trick pony and not good enough for either Utah or the rest of the country. Besides he'd just fold like a thin undershirt and shorts and vote for whatever Paul Ryan wants. It could have been phrased in a way that wasn't intentionally offensive and putting your bigotry on display. But that wouldn't be very fun, would it? And it wouldn't get you a few ugly thumbs from others who are happy to display their bigotry that they'd not accept if you similarly disparaged a Jew or Muslim. I hope you'll pardon me if I want to actually see what he runs on and how he behaves if elected. There's an old joke about a freshman Congressman who enters the House chamber for the first time and asks someone in leadership "Where are the Republicans? I want to see the enemy." The more senior Representative says "The Republicans aren't the enemy, they're the opposition. The Senate is the enemy." Very few Senators will give a damn what the Speaker of the House says. Notice even he's not stupid enough to think he could win in MA where he was governor.